The Ehrensperger Report was a publication of the American Name Society (ANS). It is a partial view of the research and other activity going on in the world of onomastics, or name study. 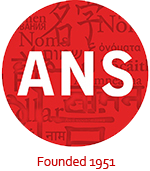 It is named in honor of Edward C. Ehrensperger, one of the founders of ANS, who for over twenty-five years, from 1955 to 1982, compiled and published this annual review of scholarship. Every summer he sent a letter to the members of the American Name Society, asking what they had done in the last year. If responses did not come back, he got on the phone to make sure coverage was complete. Failing health required him to pass the Report to Kelsie Harder, who compiled it for the years 1983-1991. The Report was, for the years 1992-2007, compiled and published by Michael McGoff. (Thomas Gasque edited the 1999 edition of the Report, due to Michael McGoff’s illness.) The last published year of the report was 2007. Each year listed below links to a PDF of that year’s Report. Click on the year to view or download the file. All PDFs were created from scans of the original Report, from Michael McGoff’s personal collection. If you have copies of the Report for any years not represented here, please get in touch: info@americannamesociety.org.